Delhi Public School DPS Srinagar Jobs Recruitment 2019. 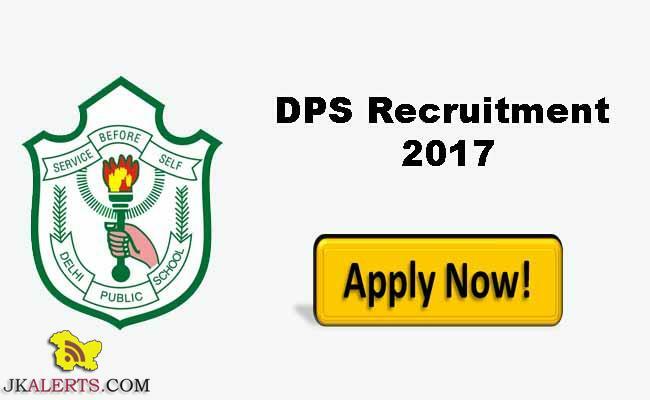 DELHI PUBLIC SCHOOL, JAMMU RECRUITMENT 2018 -19 Private Jobs in Jammu : DPS Jammu Invites Applications From Hardworking, Goal Oriented & Experienced candidates for the following posts:- Advertisement S.NO. POST QUALIFICATION EXPERIENCE 1. Counselors M.A Psychology (Clinical) 3-4 Yrs in reputed school 2. Accounts Assistant Graduate/Post Graduate 2-3 Years. Knowledge of computer is essential. 3. DELHI PUBLIC SCHOOL, SMVDU – KATRA Requires the following staff:- S.NO POST QUALIFICATION 1. PGT: English, Physics, Chemistry, Mathematics, Biology, Computer Science, Commerce, Economics, History, Political Science, & Physical Education Master’s Degree in concerned subject with B.Ed. 2. TGT: English, Hindi, Mathematics, Biology, Geography, History, Economics & Urdu Master’s Degree in concerned subject with B.Ed.